The App Store and mobile gaming as a whole is no stranger to puzzle games. These games can range from the weird to the bizarre with many different variants falling under this genre. The touchscreen naturally works well for these types of games for a variety of reasons, but one major reason for this is that many puzzle games are not filled with a lot of on-screen clutter or virtual buttons and just require a tap or drag of the finger for input. Because of the direct input from users and how they are more of a thinking-person’s type of games with not a lot of clutter needed on-screen, the genre truly found a home on mobile over the last few years. Titles like Monument Valley or what can be described as a puzzle-adventure hyrbid, The Room series, have become famous across the gaming landscape at large. Just this past week, a new puzzler arrived that should make the competition quiver just that little bit. Bombarika (Free) is a puzzle game that is unconventional in nature. It isn’t based on solving logic puzzles or moving blocks around. 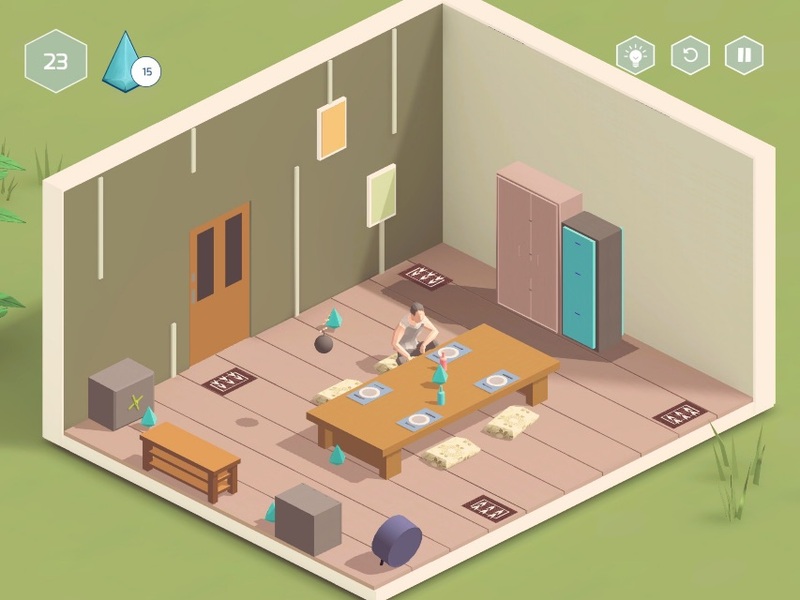 It is an isometric game, with a very gorgeous art style, that plays and looks a bit like the Go series of titles from SquareEnix and a bit of Monument Valley thrown in (as well as the recent Vandals). However, unlike those games, you do not control a main character directly in Bombarika. 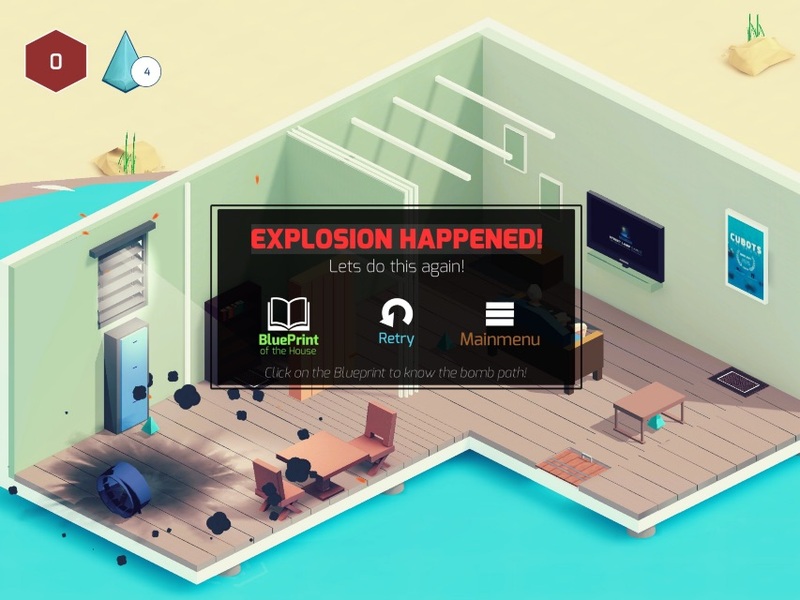 Instead you move things around rooms to make sure a bomb does not detonate inside the house. The game’s hud is very minimal to look at, but you do have a couple of things to keep an eye out for. For one, there is a timer present on the upper-left side of the screen inside a reddish hexagon. To the right of it, you have a diamond present showing you the ammount of Rikas in your inventory. Rikas will allow you to purchase different various items from the shop. Some of these items include various bombs with different effects, like offering more seconds on the clock; various TNT dynamites that will give you greater blueprint options; and a Meta Bomb that will double your Rikas gained. To gain Rikas, you simply have to go over them inside the rooms as they are represented by a diamond shape that the bomb has to travel over during trajectories you unleash on it. It is almost like added perks or collections to gain in each room if you are up for the challenge. There is also a blueprint button shown on the HUD (it is displayed as a light bulb on the upper right side of the display) available. You can take advantage of it by clicking on it and it will pause the gameplay for you while you check the layout of each room. It will show you different objects you can tap to move (or affect in some way) within the particular room, or level, and the exit. You can also access it between rounds. The game gets pretty challenging and doesn’t hold your hand except within the first few levels of the turorial. You really have to find ways to manipulate the environment around you and figure out how to get the bomb to the exit and prevent it from exploding on you. There are various ways to do this as each room has a solution that may not seem apparent at first. For instance, in some rooms you may need to have the bomb land in a safe and it will explode that way and not inside the main room, thus paving the way for you to go on to the next stage. In another room, you may need to make sure it follows a wind or fan trajectory out of the main door of the house to finish the level. These are just some examples of the way the puzzles are structured and how they vary from room to room. In terms of content and diversity of gameplay, Bombarika is up there with the best titles in the genre on any device or system when it comes to puzzlers. It is fun, accessible, and gets challenging over the long-term. It is also a very pleasant and beautiful experience to behold. The game’s aesthetics just scream quality as you look at the room and see little touches thrown in for good measure — like a house occupant playing an Atari in front of the the living room TV or another occupant eating dinner while moving his head back and forth in a natural way. The graphics or aesthetic are minimal, but at the same time, deep with touches to make it feel like a breathing and living world. Oh and did I mention the game plays incredibly well on both iPhone and iPad? It plays in the landscape orientation, thus everything is laid out nicely if you own a larger iDevice. The music is really soothing as well and will get you in the mood of the game. It fits a puzzler well and will make you relax as you lay back and use your logic side of the brain to figure the solutions to rooms’ layouts. The game is truly worth checking out for anyone in the mood to think a bit, relax, and enjoy a soothing gameplay experience that works perfectly on the touchscreen.